* NEW ZEALAND - 2 pence, 3 pence and 6 pence Victoria = 11 pence with numeral cancellation "A 3" on a beautiful cover side marked "Thames NZ OC 4 71" and sent via Aukland, London and Christiania to Aalesund. 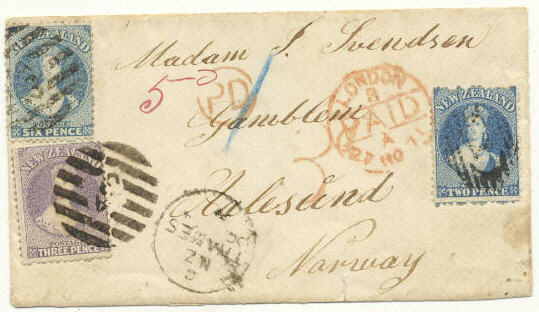 This is the earliest franked cover recorded from New Zealand to Norway. A superb exhibition piece. * INDIA - 37(10) and 70(2). Strip of six and strip of four 1/2 anna Victoria 1856 and horizontal pair 4 annas 1866 = 13 annas - cancelled "Outw. 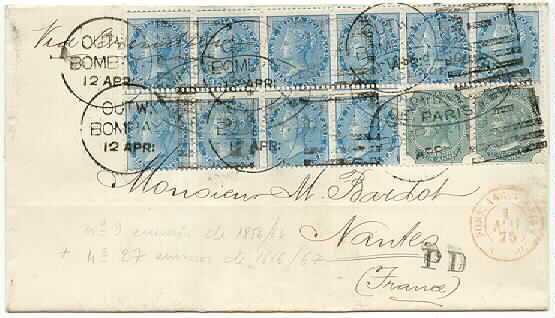 Bombay 12 apr" (1875) on cover sent via Paris to Nantes, France. Black "Sea Post Office E 12 apr:" on back.